By the consecration the transubstantiation of the bread and wine into the Body and Blood of Christ is brought about. Under the consecrated species of bread and wine Christ himself, living and glorious, is present in a true, real, and substantial manner: his Body and his Blood, with his soul and his divinity. The Second Vatican Council refers to the Eucharist is the “font and Apex” of the whole Christian life. The profound gift of Christ’s Body and Blood is essential to living as a full member in the Body of Christ. Therefore, all Catholics who are in the State of Grace and having already received their First Holy Communion are encouraged to receive the Eucharist each time they attend Mass. 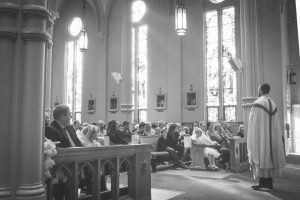 First Communion for children follows a period of training, part of the Religious Education program of the parish, and ordinarily is open to second graders. Please contact our Coordinator of Religious Education.